South Tyneside Council is calling for the public's help to track down those responsible for illegally dumping a substantial amount of waste in the Borough this week. The Council is investigating two cases where building materials, wall tiles and old bathroom fittings were illegally dumped in Waterside Park area in Hebburn and at the back of Green Lane, South Shields. It is believed the rubbish at Hebburn was dumped over the weekend (12/13 January) with the tipper making at least four trips to unload the materials although it is thought additional rubbish was also dumped after 6pm on Monday night. The waste in South Shields was fly-tipped at around 11.30pm on Tuesday night (15 January). Councillor Nancy Maxwell, Lead Member for Area Management and Community Safety, said: "These are appalling cases. It is outrageous that a tiny minority of people think they can simply discard such a huge amount of rubbish and expect taxpayers to foot the bill for it to be cleared. "We are committed to taking action against those whose reckless actions blight the beauty of our communities. However, we need the public's support. In the latest incident at South Shields a resident saw a white truck piled high with waste. We would urge any residents who have their own CCTV to check the footage and report anything suspicious in recent days to get in touch. "We would also encourage local people to remain vigilant and take a description of any suspicious vehicle, including registration details, to help us bring the culprits to justice." 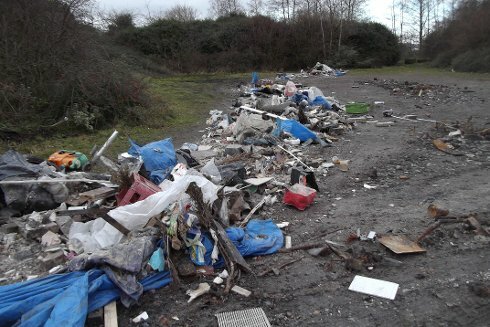 To provide information or to report any flytipping incident please contact South Tyneside Council's Customer Contact Centre on (0191) 427 7000. All calls will be treated in the strictest confidence. Residents are reminded that they can legally and safely dispose of their rubbish at the Recycling Village at Middlefield Industrial Estate in South Shields. The Recycling Village is open every day except Christmas Day. The facility is open between 9am and 6pm.